Apple's Most Overlooked Weapon? Its Balance Sheet. Talk about a weapon of mass destruction. Apple (Nasdaq: AAPL) reported its fiscal third-quarter earnings last week. This we know. Digging through the company's 10-Q that was filed shortly thereafter, investors can glean even more information on the inner workings of the largest tech company in the world. I'm looking at the balance sheet today. We already knew that Apple was up to $117.2 billion in total cash, but Apple waits until the 10-Q to disclose exactly how much of that sits abroad and how much rests stateside. On the conference call, CFO Peter Oppenheimer gave an approximation but now we have a more precise figure as to how much cash is being held by foreign subsidiaries: $81.4 billion. That leaves just $35.8 billion held domestically. Apple continues to stockpile its international war chest. 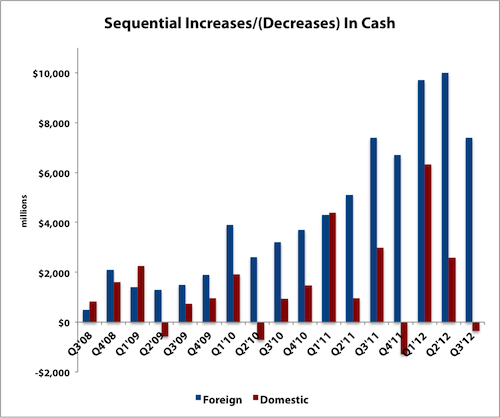 This next chart shows the sequential changes in Apple's cash balance, and you can see a clear trend of increasingly bolstering its international coffers while its domestic figure even decreased slightly last quarter. 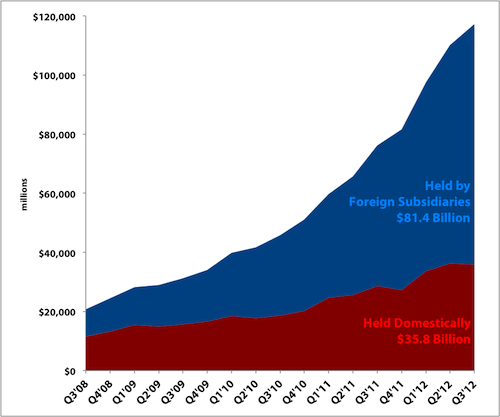 Over the past four quarters, foreign cash has increased by a total of $33.8 billion, domestic just $7.3 billion. A few months back, The New York Times ran a piece on how much of this composition is a result of elaborate strategies that Apple uses to keep down its tax bill, which isn't unique to Apple in any way, but merely the latest in the publication's string of hit pieces against the company. Fellow tech giants like Google (Nasdaq: GOOG) and Microsoft (Nasdaq: MSFT) use similar strategies. Bloomberg ran a report a few years ago on how Google uses similar tactics to lighten its tax load and even said Facebook (Nasdaq: FB), which has since gone public, was preparing to set up a similar legal maze of subsidiaries at the time. Microsoft has $54 billion stashed overseas, an even larger proportion of its total $63 billion in cash and equivalents than Apple keeps internationally. Microsoft keeps 86% of its money in foreign subsidiaries, higher than Apple's 69%. Repatriation taxes keep Mr. Softy's dollars from coming home, just like Apple's. As far as what Apple puts all those dollars in, it continues to invest primarily in corporate securities and U.S. Treasuries and U.S. agency securities. 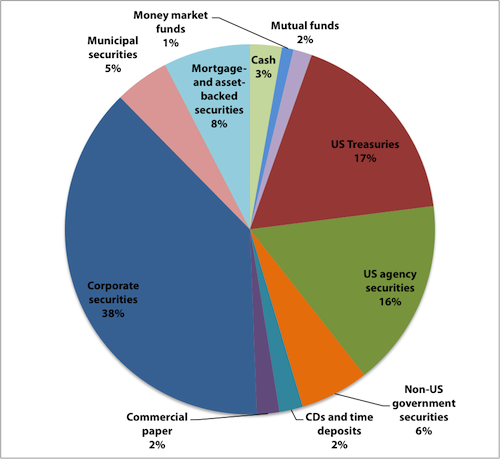 The company dabbles a little bit in mortgage- and asset-backed securities as well as non-U.S. government securities. Source: SEC filings. As of June 30, 2012. Fortunately, I don't think Apple's at risk of having any checks bounce anytime soon, which would simply wreak havoc on the iCredit score it's worked so hard to obtain. While Apple famously has no official long-term debt, the company still effectively has some through the use of off-balance sheet arrangements and contractual obligations, some of which extend through 2022. The Mac maker is also known for locking down supply of critical components, leaving rivals scrambling to find the ingredients that they need for their competing devices. 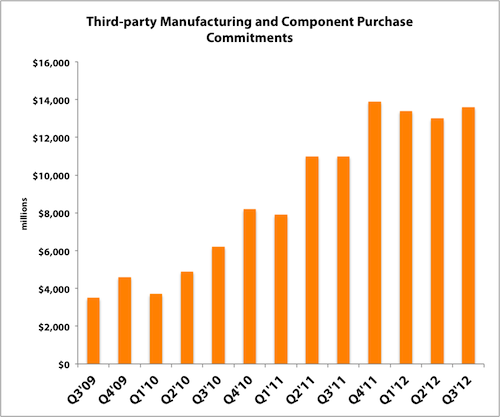 When including the commitments it has with third-party manufacturers that assemble its products as well as component purchases, Apple's on the hook for $13.6 billion. That's in addition to the $4.4 billion in component prepayments it's already made that is classified as an asset on the balance sheet. The amount of purchase commitments that Apple has agreed to has steadily risen over the years as demand for its iDevices soars. The current figure is up from just $3.5 billion three years ago and illustrates how Apple is able to lock down what it needs in advance with its weight and deep pockets. We told HP we needed better displays [for the Pre 3]. They'd come back and say, Apple bought them all. Our suppliers tell us we need to build them a factory if we want the displays and they weren't willing to put the billion dollars upfront to do that. The same thing happened with cameras. We'd pick a part; turns out Apple picked the same part. Source: The Verge. Emphasis added. Obviously, Apple has no problem putting down billions upfront to get what it needs, and its rivals are the ones that suffer for it. One downside is that all that cash artificially deflates some of Apple's efficiency metrics, such as return on assets or return on equity, among others, so the Mac maker is actually even more efficient than you think. Still, Apple has done something remarkable: It has weaponized its balance sheet. Apple's ability to lock down the broader supply chain and cripple rivals is one reason it shows no signs of slowing down in the long term. Sign up for this brand-new premium research service that's all Apple, all the time to read more.